Fires are a tragic occurrence that can have life-changing effects on many aspects of your family’s lives. House fires can be highly dangerous or even deadly, so it's important for everyone in your family to be aware of proper fire prevention and safety. Each year, thousands of children suffer mild to serious injuries as a result of fire-related situations, with nearly 500 of these cases being fatalities. Most fires can be prevented with common sense and simple fire safety techniques that will help you and your family stay safe even in the event of a fire. While home fires are a risk for any family, taking the proper precautions and having a plan of action could be life-saving if the worst should ever happen. It's critical to have a smoke detector and fire extinguisher to protect your family and home from major disasters. Smoke detectors need to be checked monthly. It’s vital for every member of your family to know how to dial 911, escape a burning home, and use a fire extinguisher, but for children in an emergency situation, this can be a lot to remember. There are many resources available that can be posted around the house to protect everyone from tragedy. Preventing a fire in the home can be accomplished by being prepared and cautious of hazards. Smoke detectors should be installed in every room of the home, especially the bedrooms and the kitchen. Keep fire extinguishers available in a known place and ensure that every family member knows how to use them. Fire hazards, such as matches and lighters, are to be kept out of reach of young children. Families should develop an escape plan and practice it regularly to ensure that everyone is prepared in the event of a fire. Children should know to dial 911 as soon as a fire is noticed to get help fast. Understanding the dangers associated to fires can help you better prevent them. 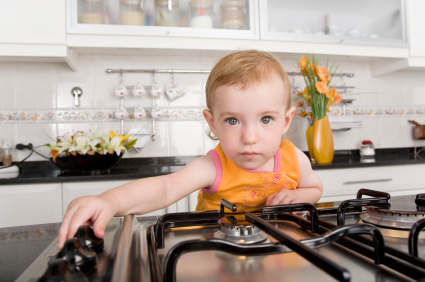 When cooking on the stovetop, always keep panhandles inwards to avoid knocking them over. Use caution when dealing with flammable liquids and lock them away from small children. Candles, stoves and other flames should never be left unattended. Look for worn out electrical cords or appliances and replace them as needed. Never overload electrical strips or wall sockets with too many plugs. Space heaters are also a major fire hazard and can be dangerous if not properly maintained. Knowing and understanding these common fire dangers is the first step to preventing them. If you are ever caught in a fire, it's important to remember not to panic. Small fires should be put out with a fire extinguisher if possible. Large fires or fires that begin to spread should be left for firefighters. Call the fire department as soon as possible and follow your family's escape plan to exit the building. Cover your face with a towel or cloth to avoid breathing in too much smoke. Feel the doorknobs for heat before opening any door. Never run into a burning building for any reason. If the fire is outdoors, try to extinguish it with a blanket or sand. ✔ Town of Highland – Know When to Go! React Fast to Fire! Knowing the proper prevention and fire safety techniques is important for both children and adults to learn. These fire facts are highly useful in stressful situations and may be essential for your survival in the event of a fire. By following these simple fire safety techniques, you can help keep your family safe at home, camp or wherever you may be. If you ever become caught in a fire, you will have the proper know-how to escape safely without harm. ✔ How to Prepare for Fire – Are Your Prepared? ✔ Kid Safety – Do You Know What to Do In Case of a Fire? The above resources were for you, the adult, and here is a list to share with your children. Fire safety education should start early, even if it is basic. Children of all ages must know how to call for help, how to get out of a burning building, and what actions to take should their clothes catch fire. It is also important for young kids to learn this kind of information using language and visuals so they understand and remember as much as possible.